Viking Today is a magazine about Viking culture and Viking life - also today. We mix past and present and try to draw lines in history from prehistoric time until today. The goal of the magazine is to bring more understanding for the relation between history and our culture and daily life today. It is our belief that more understanding of our cultural background will make it easier to understand that other people also have a cultural background and that it is as important for them as it is for one self. So even though the subject is "Vikings" it is as well culture in general. The history of a people is important - but not more important than the history and culture of other people in the world. So publishing this magazine is a hope for a more peaceful dialog between people. Maybe this hope is naive, but it is still important to work for it. The first edition of the magazine came on print in 2004. 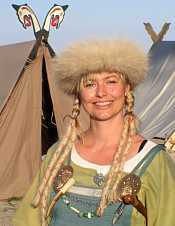 After being sold on Museums and Viking events - in Denmark and on few places in Sweden and Germany. In 2006 it was decided only to publish it on the internet in the future. Because of limited economic resources It will take some time to develop it. We hope for your understanding and patience. Ideas, information and comments are welcome. Since the magazine is produced in Denmark, there is still most information about Denmark, but the reason is only because of limited resources. The goal is to reach anybody who shares our interest on these subjects.